Well, on Monday, the markets did indeed follow through and rose towards a retest of June highs. With the markets now back to a short-term overbought extreme, the June highs may be a challenge for the bulls in the short-term. Also, it is worth noting that since the beginning of this year, “gap up” openings for the market have tended to be within a couple of days of a short-term peak. In other words, yesterday’s “gap up” opening was likely a good opportunity to trim positions that have become overweight in portfolios. For us, those were the technology and discretionary sectors, which we have now reduced back to target portfolio allocations. However, on a positive note, if the bulls can indeed muster a rally above the June highs, and can hold it, it will likely be an easy stretch back to the highs of the year. With the market climbing an advancing trend (higher bottoms and higher highs), our portfolios remain weighted towards equities, although we do remain underweight from target goals. If the “bull market” reasserts itself and shows stronger breadth, then further increases in allocations may be justified. With concerns rising, it is not surprising to see that investor “optimism” has dwindled in recent weeks, particularly as price volatility has risen sharply this year. The chart below shows the daily price movements of the S&P 500 from 2017 to present. The chart below is a composite “investor sentiment” index or rather how investors “feel” about the current investing environment. Clearly, the “exuberance” of the market has given way to more “concern” since the beginning of the year, but given sentiment remains elevated, there is little to suggest real “fear” is present. Overall, the market continues to quickly discount the various risks facing the market. But almost as quickly as one is “priced in,” another emerges. With “trade wars” now live, “Brexit” running into trouble and the November elections in the U.S. quickly approaching, there are plenty of concerns which still lay ahead. Also, we continue to be concerned about the lack of overall “breadth” of the rally, which was also noted by Jim Bianco, on Monday. We have seen this in our own data. Each week in the newsletter, I provide the relative performance of various sectors in our portfolio model to the S&P 500 index. When sectors are above trending positively, and the short-term moving average is above the long-term moving average, the sectors are on “buy” signals. When the majority of sectors are on “buy signals” and the market is rising, it suggests the overall “breadth” of the rally is strong and the market should be bought. This is what the relative performance of the model was one year ago at the beginning of July, 2017. The deterioration in sector performance is indicative of a late stage market cycle, rising risks, and declines in risk/reward backdrop. 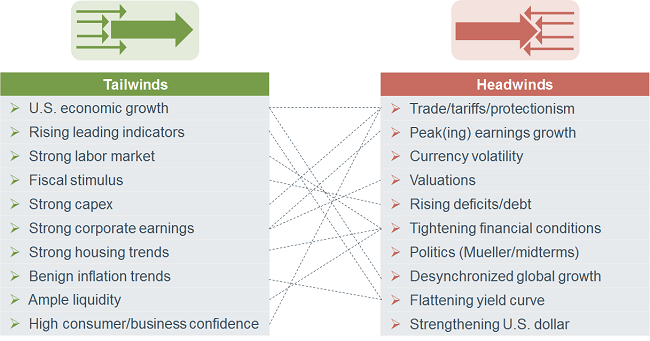 Combine the weakening performance backdrop with a market back to overbought conditions, following an abbreviated rally, and you can understand why we remain more cautionary on the intermediate-term outlook. “Friday’s breadth continued the strength we’ve been seeing. This makes it six consecutive green days for breadth. “Last week we used the Nasdaq Momentum Indicator to pinpoint Tuesday as the day we got oversold. If I use this same method to find the overbought time frame it’s far too wide to be of use. For example, it shows an overbought reading sometime between this Tuesday and next Tuesday. “Thus the conclusion is that in the latter part of this week we should reach an overbought condition. The number of stocks making new highs on the NYSE increased. It’s nothing to write home about but at least it increased. We remain cautious for now until the investing risk/reward scenario improves enough to warrant additional equity exposure. Could we miss some of the rally before that occurs? Sure. We have no problem with that. Opportunities to take on additional market risk come along about as often as a taxi cab in New York City. However, for us, the “fear of missing out” is much less important than the “fear of losing money.” Spending our time working to recoup losses is a process we prefer to avoid. 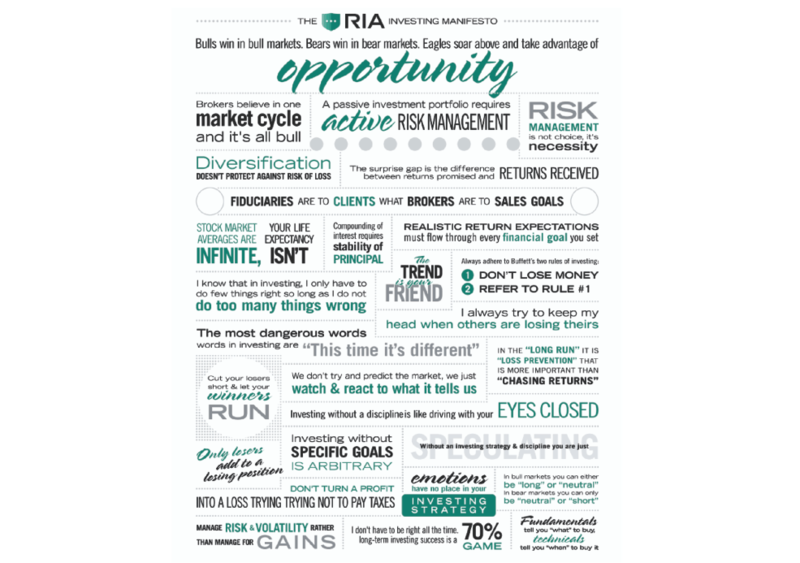 Click here to download our investment manifesto.